The 2019 bull run continues. The Dow Jones Industrial Average closed 211.22 points higher at 25,928.68 today, and CNBC reports that the S&P 500 has notched its best start to a year since 1998. What happened to that inverted bond yield??? Perhaps that’s all just more goodness for the soon-to-be rampant unicorns, including Lyft, whose IPO float today send the stock trading up 8.7 percent to $78.29, with more than 70 million shares trading on its first day as a public company. That lifted Lyft’s market valuation to $22.2 billion. Other unicorns likely to be unleashed into the wild soon? Uber, Slack, Pinterest, among others. Just remember, Lyft is currently #2 in the ride-hailing pecking order and lost $900 million in 2018. While we’re on the subject of moolah, let’s talk about TechCrunch’s story about consumer spending on apps. Sarah Perez’s headline suggests that spending will reach $156 billion across iOS and Google Play by 2023. Yes, you read that right. That research estimate came from app store intelligence firm Sensor Tower, and suggests that both stores will more than double their revenues over the next five years. That’s +16.8 percent CAGR, if you’re counting along. Getting further down into the numbers, that’s an estimated $96 billion for Apple and $60 billion for Google, with Apple taking nearly 62 percent of all revenue generated by the two platforms. To put that in perspective, the global film industry was worth an estimated $136 billion as of 2018. Time to hone those developer skills, because the bull run appears to continue across the board. Good morning and Happy Tuesday. Here’s hoping you got everything you wished for on Black Friday and Cyber Monday. I bought some coffee, which isn’t very cyber, I know, but hey, a man’s gotta have his caffeine. You know who else might need some caffeine soon? Yesterday, justices of the U.S. Supreme Court (hereafter referred to as “SCOTUS”) appeared open to letting a lawsuit proceed against Apple that accused it of breaking federal antitrust laws by monopolizing the market for iPhone software applications and causing consumers to overpay. The nine justices heard an hour of arguments in an appeal by the Cupertino, California-based technology company of a lower court’s decision to revive the proposed class-action lawsuit filed in federal court in California in 2011 by a group of iPhone users seeking monetary damages. The lawsuit said Apple violated federal antitrust laws by requiring apps to be sold through the company’s App Store and then taking a 30 percent commission from the purchases. Reuters points out that while developers set the prices of their apps, Apple collects the payments from iPhone users and keeps 30 percent commission on each purchase. Developers earned more than $26 billion from the store in 2017, a 30 percent increase from the year before. Developers and data scientists in the Big Apple, be forewarned! IBM and Galvanize are hosting a three-day Cognitive Builder Faire in New York City this weekend which will include workshops, tutorials and hands-on labs delivered through IBM’s Data Science Experience. The technology industry is facing a shortage of experienced developers and data scientists to address the growing demand for cognitive and AI development. IDC predicts that by 2018 75 percent of all developers will embed cognitive technology in their applications. IBM and Galvanize are partnering to bring cognitive skills and data science curriculum to individuals interested in some of the most lucrative careers in technology. Throughout the weekend, developers, data scientists and technology enthusiasts will have an opportunity to build cognition solutions with various Watson APIs available on the IBM Bluemix cloud platform, including Watson Conversation Service, as well as the data science Foursquare API. Tutorials will also cover Node.js and machine learning fundamentals with Python/R. The Watson APIs simplify the process of building tools that rely on language, speech and vision analysis, and discovery. If you are interested, you can register for the event online. Clouds moved into the Austin area overnight. Just in time for my flight to Las Vegas tomorrow. What happens can’t stay in Vegas if I can’t even get there. But clouds also continue to permeate the IBM milieu, this time with an announcement around cloud testing. According to a recent IBM survey of 2,000 IT pros worldwide, cloud computing and mobile have emerged as the most in-demand platform for software application development and IT delivery over the next five years. With yesterday’s announcements, IBM is extending its environment to allow more enterprise developers to take advantage of the cloud for development and testing. Specifically, IBM expanded its Smart Business Development and Test on the IBM Cloud with support for Windows and with new enhancements to better serve teams of developers. IBM also introduced an integrated development and test environment, along with new software and services, to allow developers to improve quality and speed across the application life cycle. Announced earlier this year, the IBM Smart Business Development & Test on the IBM Cloud allows enterprise clients to expand and enhance internal development and test processes with instant access to resources through IBM’s secure, scalable cloud delivery model. Attach combinations of storage sizes to a virtual instance at the time of provisioning, ensuring higher performance and resiliency. IBM also introduced an Integrated Development and Test Environment, an end-to-end solution approach that integrates tools, processes and cloud infrastructure to enable clients to conduct more robust and complex testing earlier in the application development life cycle, while also reducing the cost of identifying and fixing software defects. IBM Testing Services for Cloud – application virtualization: Clients rapidly create multiple virtual test environments customized for each development and testing team. By providing testing teams with 24/7 availability without dependencies on back-end systems and data stores, the service gives testing teams the ability to test more thoroughly throughout the life cycle without worrying about data or service availability. A North American company using this service experienced a 22 percent reduction in the Function and System Test cycle and a 100 percent return in ROI within 90 days. IBM Testing Services for Cloud – performance testing: Brings together automation and performance testing tools to significantly reduce time by as much as 50 percent, the service provides flexible, utility-based testing that delivers on-demand performance testing, and offers robust, large-scale performance testing services to enterprises, via Cloud hosting. This service identifies defects earlier in the cycle where they are less expensive to fix and eliminates performance-related bottlenecks. IBM Rational Load Testing on the IBM Cloud: Helping to address issues with infrastructure acquisition, maintenance and configuration for large scale performance testing by leveraging the IBM Cloud, IBM is announcing a technical preview of IBM Rational Load Testing on the IBM Cloud. The solution allows testers using IBM Rational Performance Tester to automatically provision virtual test agents and generate virtual users on IBM Smart Business Development and Test on the IBM Cloud on a pay-as-you-go basis, significantly reducing infrastructure, software and test set up costs. IBM Deployment Planning and Automation: Taking advantage of existing IBM Rational and IBM Tivoli software tools, the new solution manages the automation and planning of software deployments into the cloud and other environments. Designed for organizations that need to deploy applications in a consistent manner, the suite of software supports the entire deployment lifecycle from environment discovery through deployment planning, to deployment automation and governance. IBM is continuing to build an ecosystem of partners to deliver the most complete and comprehensive cloud computing solutions to clients. This ecosystem comprises existing and new cloud partners: Cohesive Flexible Technologies Corp (Cohesive FT) allows customer controlled networking in a cloud, Servoy provides a rapid application development and deployment environment for creating and building high-end enterprise applications on the cloud. “Cloud users have been waiting for an enterprise-grade cloud infrastructure from a recognizable and trusted vendor. IBM is clearly the answer. Now customers can take advantage of application layer network control and security with VPN-Cubed inside the IBM’s Smart Business Development and Test Cloud,” said Patrick Kerpan, CTO of CohesiveFT. IBM has also added online workshops, skills tutorials, cloud computing technical resources and social networking tools that enable users to build online relationships, share content, and grow a worldwide network of peers to drive innovation. Visit here to learn more. Smart Business Development & Test on the IBM Cloud allows clients to work with their own images as well as images from across IBM Software Group including exciting offerings from the Rational, Information Management, WebSphere, Lotus and Tivoli brands, available in a variety of flexible licensing models. Smart Business Development & Test on the IBM Cloud is now available in North America and Europe with the Raleigh, North Carolina, USA and Ehningen, Germany data centers supporting the IBM clouds. Visit here for more information on IBM’s cloud services. Visit here to get more information on Smart Business Development & Test on the IBM Cloud. I’ve been in NYC much of this week attending IBM meetings as well as meeting with key IBM partners. I had the opportunity to attend a Google Tech event at the NYC Googleplex on Wednesday, and got the lowdown on their view of the current interactive marketplace, including the continued and ridiculous growth of the smartphone market. One Google exec indicated that 200,000 Android smartphones are being sold every day, and that Google had witnessed a 50% increase in mobile search queries in the first half of this year alone. 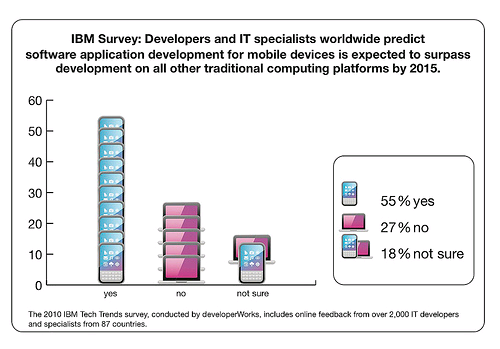 Well, it seems as if an audience of you IT professionals out there are agreeing on the growth and importance of mobile (among other key areas) in a new survey IBM developerWorks recently conducted, the 2010 IBM Tech Trends Survey. The headlines? Mobile and cloud computing will emerge as the most in-demand platforms for software application development and IT delivery over the next five years. Developers and IT specialists polled by IBM around the globe indicated that the mobile market would emerge as the hottest software development realm by 2015. The 2010 IBM Tech Trends Survey provides insight into the most significant enterprise technology and industry trends based on responses from 2,000 IT developers and specialists across 87 countries. According to the survey, more than half of all IT professionals – 55 percent — expect mobile software application development for devices such as iPhone and Android, and even tablet PCs like iPad and PlayBook, will surpass application development on all other traditional computing platforms by 2015. With the proliferation of mobile devices, industry analysts are predicting mobile applications sales will undergo massive growth over the next three years (as if they haven’t already! ), with estimates of mobile application revenues expanding from $6.2 billion this year to nearly $30 billion by 2013! Supporting the growing number of software developers creating new applications for mobile devices, IBM now offers no-cost mobile computing technology resources, through IBM developerWorks, for application development on mobile platforms such as iPhone, iPad, HTML5 and Android. IBM also today launched the first developerWorks mobile application for the Apple iPhone, providing developers around the world with mobile access to build skills and network with colleagues using the professional social networking platform, My developerWorks, built on IBM Lotus Connections. Telecommunications, financial services, healthcare, and energy and utilities rank as the top four industries in which respondents identify as having the greatest opportunity to expand their careers. The online survey, conducted by IBM developerWorks of its eight million registered users in August and September 2010, includes responses from IT professionals with expertise in areas such as enterprise and web application development, system and network administration, and software testing and architecture. New cloud computing resources including online workshops, skills tutorials, cloud computing technical resources, and social networking tools that enable users to build online relationships, share content, and grow a worldwide network of peers to drive innovation. Cloud Computing for Developers virtual events this October, with four dates when IT professionals can learn how to solve business and technical challenges in the cloud. Through real-world examples of specific challenges and solutions as well as live demos of techniques and products, attendees can learn more about how to use and build cloud-based applications such as Platform as a Service (PaaS) and Infrastructure as a Service (IaaS) using IBM and open technologies. Technical information on the IBM Industry Frameworks, a combination of software and hardware that bridges the gap between general purpose middleware and industry specific business applications to help organizations apply technology more easily to their unique industry. Today, developerWorks is the largest and most visited global site to gain technology skills. Over four million IT professionals visit developerWorks each month to gain no-cost access to software tools and code, IT standards and best practices across various industries. Users also tap skills training in IBM software and open technologies including Linux, Java, XML and cloud computing. I am proud to say I’ve personally been affiliated with developerWorks for several years now through my blogging efforts, and in my partner podcasts with developerWorks podcasting guru and all-around media star, Scott Laningham. You can go here to learn more about IBM developerWorks, which, by the way, just celebrated its 11th birthday.